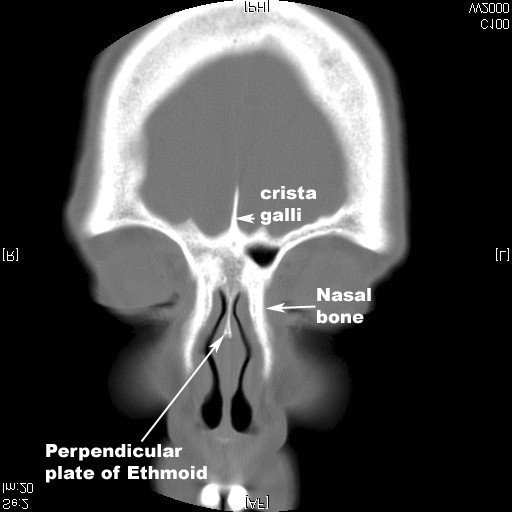 The crista galli (Latin: "crest of the rooster") is the upper part of the perpendicular plate of the ethmoid bone, which rises above the cribriform plate. The falx cerebri (fold of the dura mater) attaches to the crista galli. 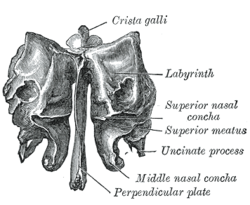 The olfactory bulbs of the olfactory nerve lie on either side of the crista galli on top of the cribriform plate. ^ "Ethmoid bone". www.anatomynext.com. Retrieved 2018-03-01. "Anatomy diagram: 34257.000-2". Roche Lexicon - illustrated navigator. Elsevier. Archived from the original on 2014-01-01. This page was last edited on 27 November 2018, at 03:17 (UTC).